For a guy who insists that federal bureaucrats make too much money, incoming House Majority Leader Eric Cantor sure doesn't mind handing out handsome government raises of his own. Cantor, the Virginia Republican who has led the GOP charge this year to freeze federal salaries, has boosted his congressional office's payroll by 81 percent since coming to Congress in 2001 - about 8 percent per year through 2009. When he became minority whip last year, the office's personnel expenses went up by at least 16 percent. Cantor and other GOP leaders are now pledging to cut their budgets by 5 percent when they take over the House in January - a symbolic gesture aimed at showing a commitment to slowing Washington spending. But the lawmakers suddenly calling for wage cuts often haven't practiced what they're preaching. Firebrand Republican Michele Bachmann of Minnesota has for months pushed legislation to freeze what she calls "unconscionable" federal salaries. Meanwhile, her own payroll jumped 16 percent between 2007, when she came to Congress, and 2009. Rep. Jason Chaffetz, the Utah Republican set to chair the House subcommittee overseeing the federal work force, says Washington must "figure out how to do more with less." But the freshman lawmaker gave his own employees an average raise of about 9 percent this year. Sen. Tom Coburn, R-Okla., who has long criticized federal pay, has overseen an average jump of 8 percent per year in his office employee costs between 2006, his first full year in the Senate, and 2009. The lawmakers offered various explanations for their rising costs, with many saying they were simply going along with the budget allowances that Congress sets each year for its members. Some said they were working to hire the best staffs they could to serve their districts or had new demands such as the need to hire a social media coordinator. Chaffetz and Coburn emphasized that while they may have spent more on salaries, they still came in well under the overall budget for House and Senate expenditures. "What's important to me is that we drive the overall number down," he said. Cantor spokesman Brad Dayspring said his boss deserves credit for recognizing the issue now and working to address it. "The new Republican majority will cut spending, and Eric believes that effort starts with his team," Dayspring said. The issue of federal salaries came to a head last month when President Barack Obama took a page from the Republican playbook and proposed freezing civilian federal wages for two years. 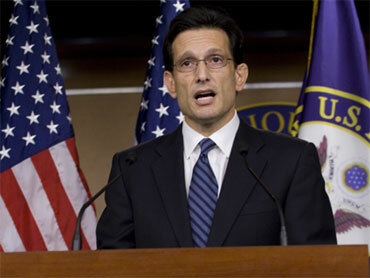 Cantor and other Republicans had offered similar plans earlier in the year that were widely panned by Democrats. Conservatives argue correctly that federal payrolls have outstripped the private sector's in recent years. Total U.S. private personnel costs rose just 25 percent from 2001 to 2009, compared with 39 percent for the civilian federal workforce's. But the comparison doesn't account for the explosion in federal homeland security hiring that followed the Sept. 11, 2001, terrorist attacks that has helped fuel the federal increase. And even with that jump, the number of federal employees has fallen over the past 20 years from 1 for every 110 residents in 1988 to 1 for every 155 residents in 2008, according to the latest federal budget. While studies show that the federal work force overall earns a higher average salary, that's because the government has more professional employees than the private work force, which includes a heavy contingent of lower-paid service employees such as fast-food workers and hotel housekeepers. When similar high-skill jobs in the public and private sectors are compared - engineers, physicians or scientists, for example - the government workers generally make less than their private-sector counterparts. A 2002 study by the Congressional Budget office found that for 85 percent of federal professional and administrative personnel, their pay was more than 20 percent below private salaries. Meanwhile, congressional payroll costs have climbed at a far faster pace than either the federal government's or the private sector's. Between 2001 and 2009, Congress boosted its personnel costs by 51 percent, according to Legistorm, increasing it steadily under both Democratic and Republican leadership. A recent House survey found that lawmakers doled out merit raises averaging nearly 6 percent in 2008. Most of them also gave cost-of-living adjustments of 3 or 4 percent, and one-time bonuses averaging several thousand dollars, the survey found. Most federal workers get raises of 3 or 4 percent per year. Colleen M. Kelley, head of the National Treasury Employees Union, said the congressional practice shows that lawmakers understand they need competitive salaries to get good employees. "The federal government needs to be able to hire and keep talented and skilled employees, and worsening federal pay will make that much more difficult," she said.